The ways in which you might cause damage to an opponent when using a knife might seem obvious, but there is more to this ubiquitous weapon than just cutting people. As mentioned in my previous post, most knives can be used as both an edged weapon and a pointed weapon. That covers the slashing and stabbing that people associate with knives. But let’s not neglect the potential of the other parts of the knife. As an example, let’s look at my CRKT M16-04Z. 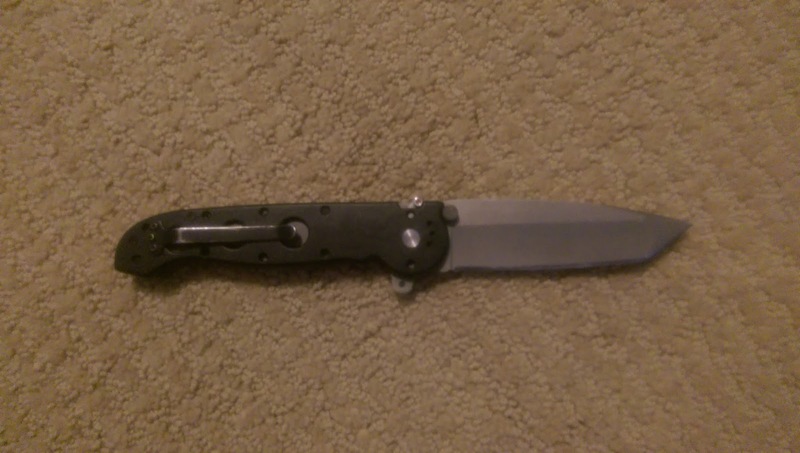 Just for reference, the blade is 4 inches long (in Texas, you can legally go up to 5.5 inches). From end to end, it’s about 9.25 inches. Here’s what it looks like in my hand. As I said, the blade and point are the obvious danger zones of this weapon. But there are some other ways of striking with it. 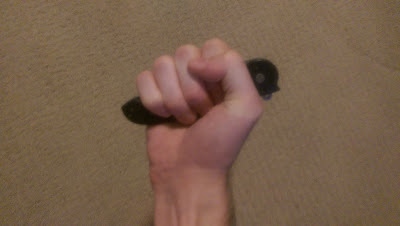 For example, look at the part of the handle that protrudes out from the bottom of my hand. It may not be “sharp” per se, but it’s enough of a corner to do some serious damage as an impact weapon. I’m a big fan of hammer fist strikes already. 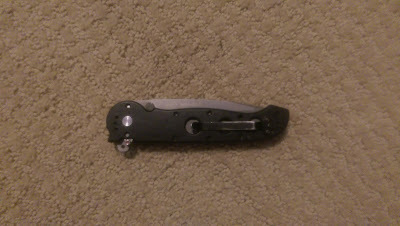 So this part of the knife just augments those strikes. In the Apache Ghost Dog system, striking with that part of the handle is called an “eagle’s beak”. If you’ve ever had, the back of you hand hit in knife sparring with one of these…you know it hurts badly. Let’s not forget that the blade (particularly the one on this knife) is a slab of metal with some weight behind it. Beyond the cutting/stabbing parts of the blade, hitting someone with the flat of the blade can be jarring and painful. In sparring, I do this using a whipping motion similar to a back fist strike. I use it to either hit my opponent’s weapon out of their hand or to just do damage to their hand. It’s very fast and gives up a minimum in terms of openings. In the Apache Ghost Dog system, this is called a “snapping turtle”. When you feel it, you’ll know why. Now obviously, if you have a little blade, this isn’t going to be as effective as, say, a bowie knife. So, know your weapon. Now, most knives that people carry around these days are folding knives rather than fixed blades. Just because a knife isn’t in the open position, doesn’t mean that it can’t do damage. As you can see, I still have the eagle’s beak strike available to me. I also have a similar strike on the other end. 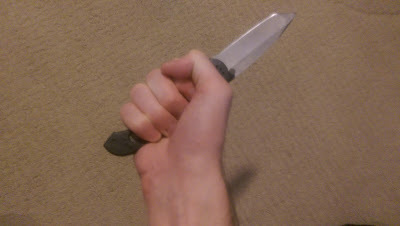 If effect, a closed knife is like a kubaton, which is a small impact weapon like the one below. You should also note that my knife fits excellently into my hand, weighting it for more devastating punches. 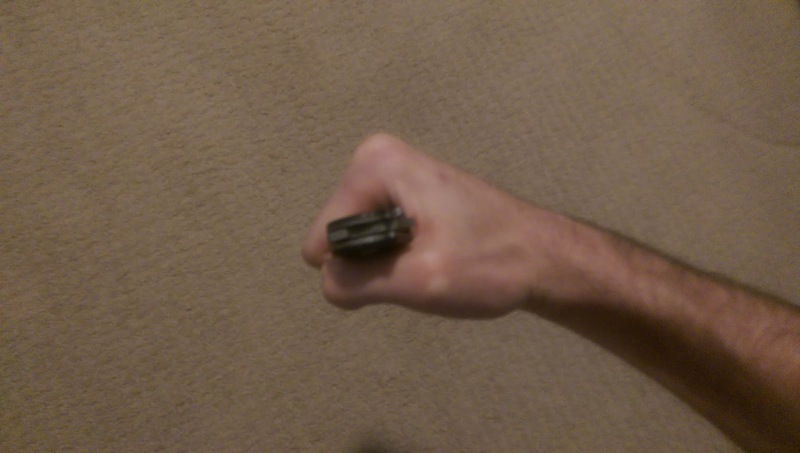 So, even in the closed position, I have heavy punches and impact weapon potential for hammer fist strikes on either side of my fist…all before I even deploy the knife. This can be useful knowledge when faced with a self-defense situation in which you are able to pull your knife but don’t quite have time to open it. Hit the bad guy somewhere painful, and when you have a couple seconds to open your knife, do so. Knives are dangerous weapons in many ways, obvious and non-obvious. I didn’t mention throwing your knife, but that’s a possibility as well. Though I’m more in the camp of “why would I throw away a good blade?” All of this is just to highlight the point of my last article that weapons can fit into multiple categories. So, understand what you can do within a weapon category and you can quickly figure out how to effectively use any weapon that fits into those categories. In this case, knowledge of pointed, edged, impact, and even projectile weapons will help you to more effectively use knives.